Die cutting is a process that enables manufacturers to create an endless variety of custom shapes and styles for a given product. By using die cuts we can add scores, punched holes, partials cuts, and perforations to create a variety of beautifully decorated folding carton designs. A beautifully printed sheet of paperboard is great to have but there is still work to do in order to transform it into an eye-catching piece of packaging. 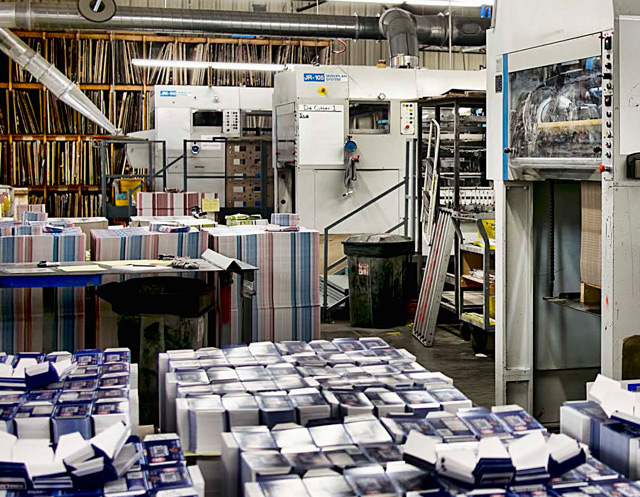 Precision die-cutting equipment and experienced staff ensure that your folding carton product is done right every time. Interchangeable dies for all three of our die cutters allow for flexibility in scheduling and consistency in the finished die cut product. Our staff at Color Craft has made thousands of different kinds of folding carton designs for an array of applicable uses. From packaging and point-of-purchase to countertop displays and more, each one is custom built for its particular application and purpose. With our exclusive technology, virtually anything is possible. It allows allowing us to execute even the most imaginative idea with optimum accuracy. In addition, by streamlining the communication between engineering, fabrication and cutting, we not only ensure top quality but also the most efficient process.